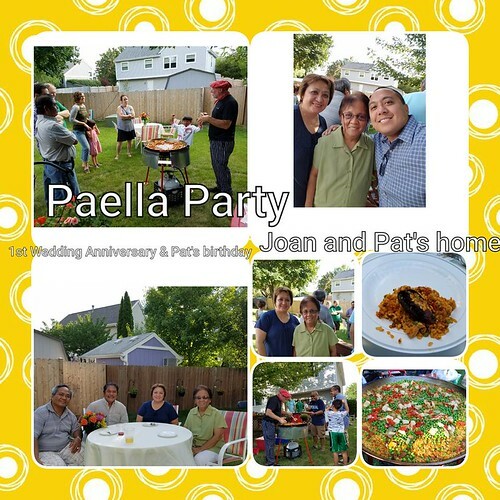 1st Wedding Anniversary: Spanish Paella Party! The past week has been a busy one (hence the slight break in new posts) but I'm happy to be back! 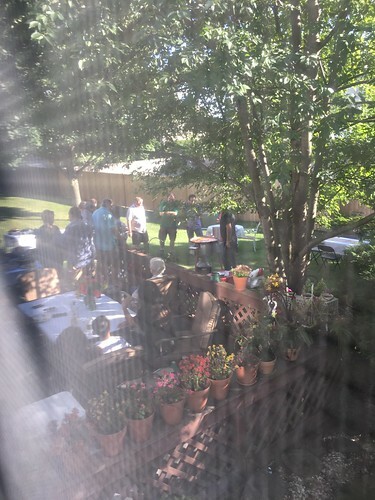 It started off a couple weekends ago where we celebrated my father in law's birthday. 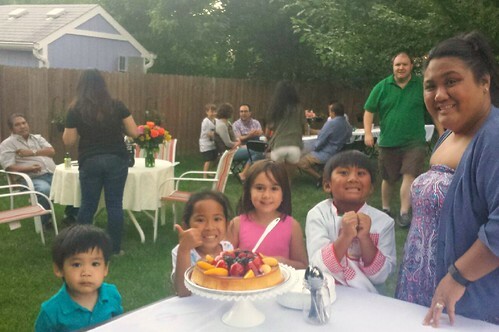 A week later, we celebrated my husband's big 40th birthday and an early celebration of my mother in law's birthday. 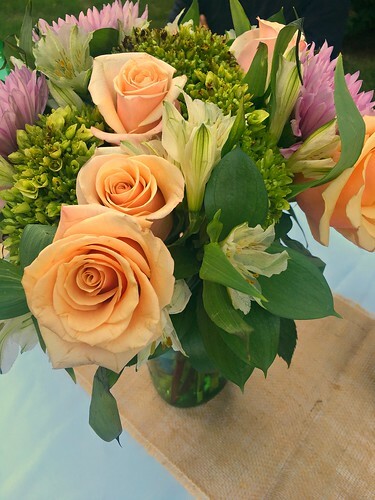 This past weekend, we celebrated our 1 year wedding anniversary. So, it's safe to say that this is our family's celebration season lol. Our 1st wedding anniversary is a very special one for both of us - one that we value quite a bit, given some of our personal history. Having the opportunity to look back on the past year has allowed both of us to fall more in love with each other knowing the journey we've taken previously and where we are headed in the future together. 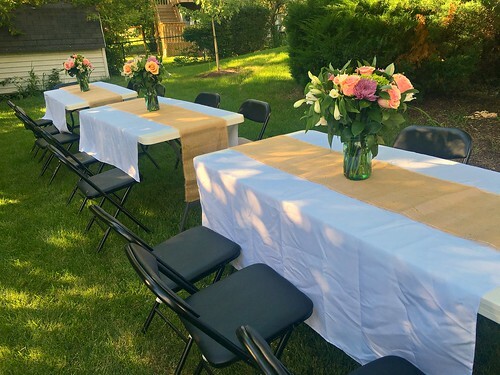 To celebrate, we wanted to bring back our loved ones who have been there for us as a couple; our wedding party! Just a year ago, we were gathered around family and friends for our wedding. It was not a traditional wedding by any means (and we aren't exactly the most traditional people either.) So for our wedding party, we didn't chose individual bridesmaids or groomsmen. Instead, we made it a family affair with chosen families to go down the aisle together as our witnesses. 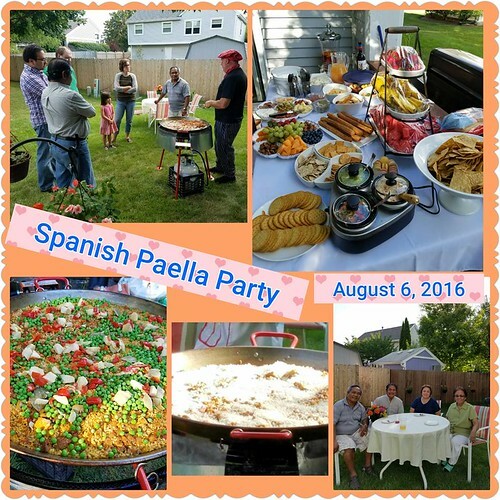 These family friends came over once again over the weekend to join in a celebratory Spanish Paella Party for our first wedding anniversary. Patrick and I love Spanish cuisine and culture. 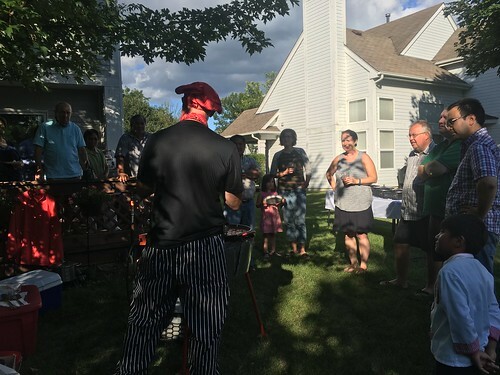 And last year, we had a Spanish Paella party that was a great success. 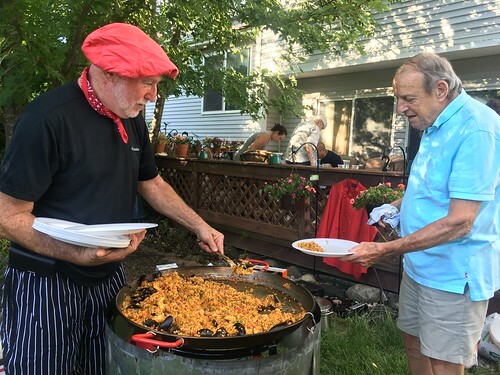 We decided to do it again and are looking forward to doing an annual Spanish Paella party for years to come! 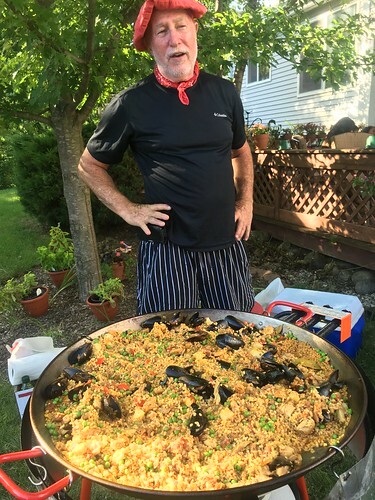 To make it possible, we hired Chef Ken Gluckman of Paella Party Catering. 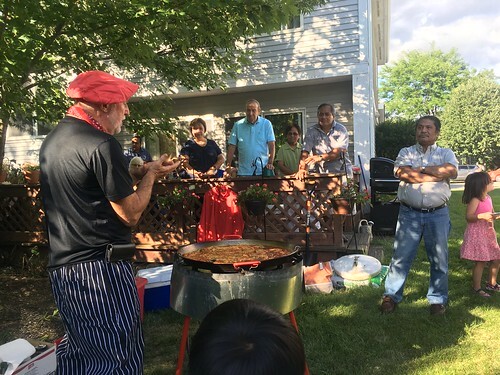 He prepared his amazing paella from scratch for our guests while talking about the history and culture of Spain. It was a great experience for our guests and a delicious meal as well. 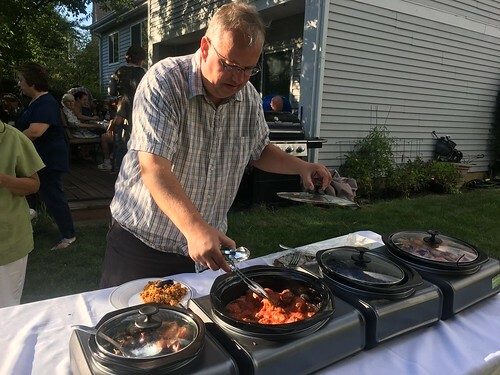 While Chef Ken took care of the paella, I prepared a spread of various tapas and appetizers for our guests to enjoy before and during his demonstration. 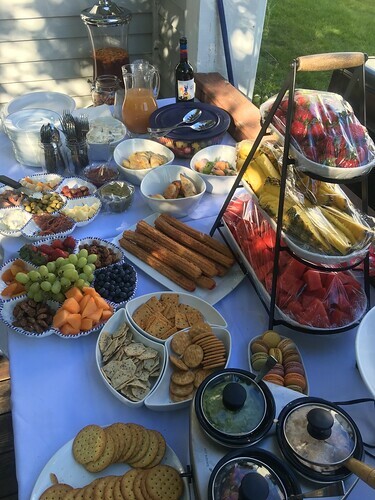 We made sure to have a colorful table with fresh fruits, cheeses, crackers, cured meats, empanadas, spanish pimento cheese dip, guacmole, pico de gallo, tortilla chips, etc. We also had 3 types of sangria - 2 versions of a classic red wine sangria and a tropical white wine sangria. Sneaking in on the table are some filled churroes and macarons. 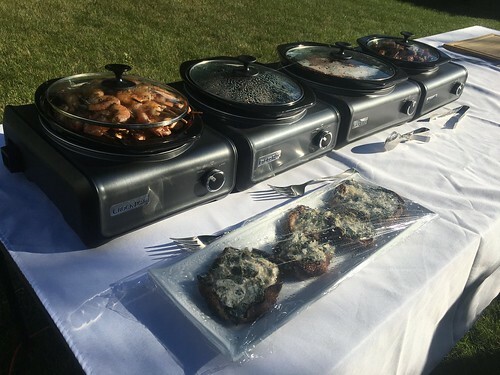 Another spread of hot & warmed tapas were provided that included bacon wrapped dates, Spanish meatballs, grilled beef short ribs, chicken pinchos (skewers), garlic shrimpi pinchos (skewers), grilled garlic bread and spinach & cheese stuffed portabello mushrooms. Everyone had so much fun! The party continued well into the evening and we loved every minute we spent with our closest friends and family. 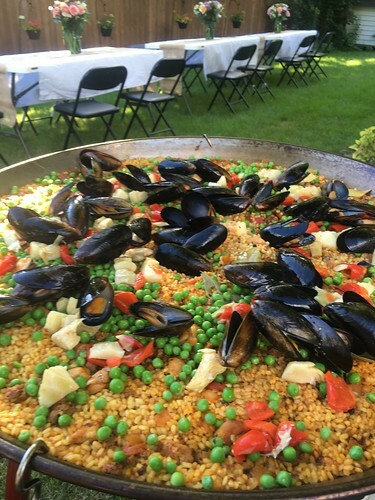 There's no doubt our Spanish Paella party will be a summer tradition with our wedding party and we're already looking forward to next year.